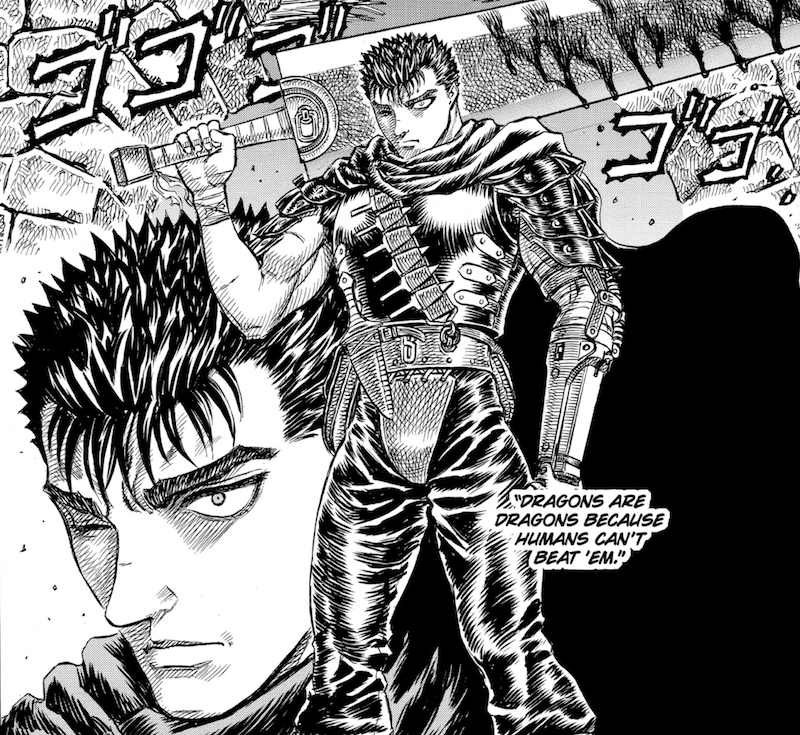 In the dark fantasy manga Berserk, the protagonist Guts wields a weapon called the dragon slayer. It is: too big to be called a sword, like a heap of raw iron. 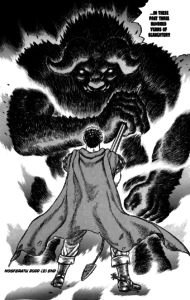 Preternatural versus mortal limits is a recurring theme in Berserk. It is a story of humans consistently transgressing cosmic boundaries, both of ability and morality. In this context, the name of the weapon, dragon slayer, has a certain literal meaning which may not immediately be apparent given the somewhat mundane rendering in English and the naturalism of many modern fantasy stories, where dragons are more like powerful, possibly intelligent, carnivores with strange biology. 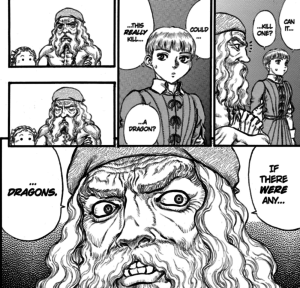 In Berserk, Dragons are dragons because humans can’t beat ’em. Dragon here is shorthand for higher being, creature beyond or outside of complete human understanding. As with narrative fiction, tabletop roleplaying games have a challenge regarding how to confront the supernatural. The two most common approaches, naturalizing the supernatural or protecting it from players by fiat to maintain danger and mystery, have drawbacks. Using fiat threatens the integrity of the game at a fundamental level, at least for the kinds of games I find satisfying, so I will dismiss that option immediately. I will argue that there is another way to approach the supernatural, though it may rely to some degree on referee artistry, perhaps being impossible to entirely systematize. In exploring this tension, Berserk seems to implicitly advocate for the possibility of transcendence. After all, time and again Guts triumphs over demonic, superhuman apostles using only human faculties and ingenuity, apart from the occasional dose of healing elf dust2. There is clearly some sort of categorical separation between the natural and supernatural in the world of Berserk, but humans, or at least some humans if you want to take an aristocratic stance, can, through enduring pain or sacrificing others, break through this barrier. Berserk is in this way metaphysically optimistic, with the caveat that the story is so far incomplete. 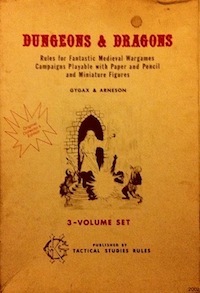 Traditional Dungeons & Dragons models the dichotomy between the natural and supernatural, at least in terms of combat, by differentiating categorically between magical and mundane weapons. The immediate system benefit of a magical weapon is a numerical bonus, leading to the sword +1, but what makes a magic weapon truly magical is the ability to damage creatures from the lower planes or insubstantial undead which are otherwise immune to mundane, physical attacks. Other systems apply hierarchies to damage. Rifts, to model the conflict of different tech levels, has mega-damage, which equates one point of mega-damage with 100 standard damage points. Lamentations of the Flame Princess introduces a hit point system for vehicle integrity, which equates one ship hit point with ten normal hit points. Plus-style magic weapons are unsatisfying due to ubiquity in mainstream D&D, coupled with general aesthetic blandness. 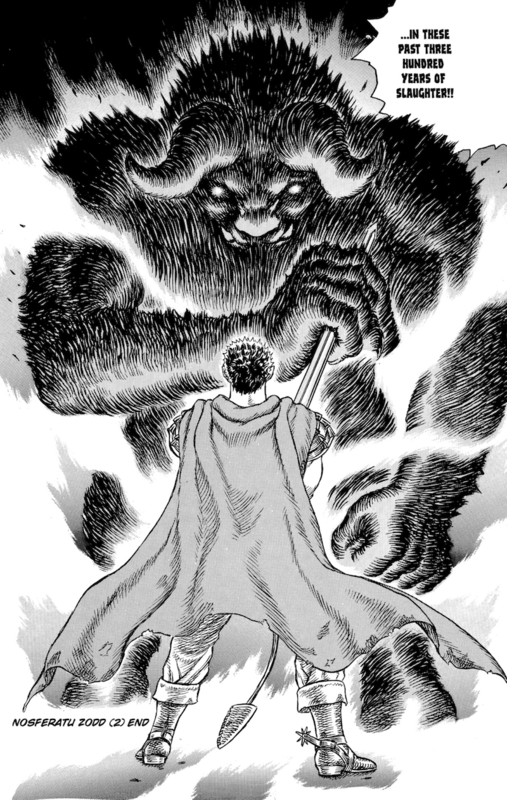 Additionally, plus weapons completely fail to capture anything of the tension between mortal and supernatural in Berserk—and, I would argue, some of the most effective weird fiction. The ship hit points approach has more promise. Humans can affect the supernatural, but only by dealing damage beyond some threshold barely attainable by human standards. This uses numerical order of magnitude to model supernatural hierarchy. However, using a system based on damage threshold is interactive in that it depends on many other system details, such as whether weapon damage is flat—like in OD&D where all weapons do 1d6 damage or whether a bonus from strength augments damage. The variability of damage available to adventurers will determine how accessible the supernatural becomes to a Guts-style assault. In OD&D, I might make one supernatural hit point equal to six normal hit points, which would make damaging the supernatural attainable to any mortal, but only with low probability, unless players can even the odds through creative play. This would be in keeping both with the themes explored in Berserk and the nature of OD&D. In a game like B/X with variable weapon damage and the strength bonus applying to damage rolls, a threshold of 10 might be appropriate, though a damage threshold would make having an average or low strength score that much more of a disadvantage, a game feature which draws attention back toward the character sheet and away from creative problem solving. Additionally, increasing the importance of the strength score could create fairness concerns, though that is at most a minor problem for me. This might be an issue in a game that pushes 3d6 in order while punishing player mistakes lethally. Lamentations of the Flame Princess operates on a similar numerical scale without applying the strength bonus to damage, giving only the largest weapons—and firearms, possibly—any chance of wounding supernatural entities. Using a damage threshold for affecting the supernatural has some other game benefits. First, it is in line with a general trend toward removing level-based gates on character abilities, such as spells without levels and finding ways to make the endgame, such as building strongholds, accessible throughout play. Second, a damage threshold increases the potential contributions of fighters in supernatural challenges without relying on semi-magical special move powers, facilitating a less super-heroic, or low-fantasy, tone. This entry was posted in Rules and tagged combat on September 11, 2018 by Necropraxis. Torchbearer uses an Order of Might for creatures, specifying what types of conflict you can have with a creature. The order of might seems opposed to how this sort of thing goes down in Berserk. 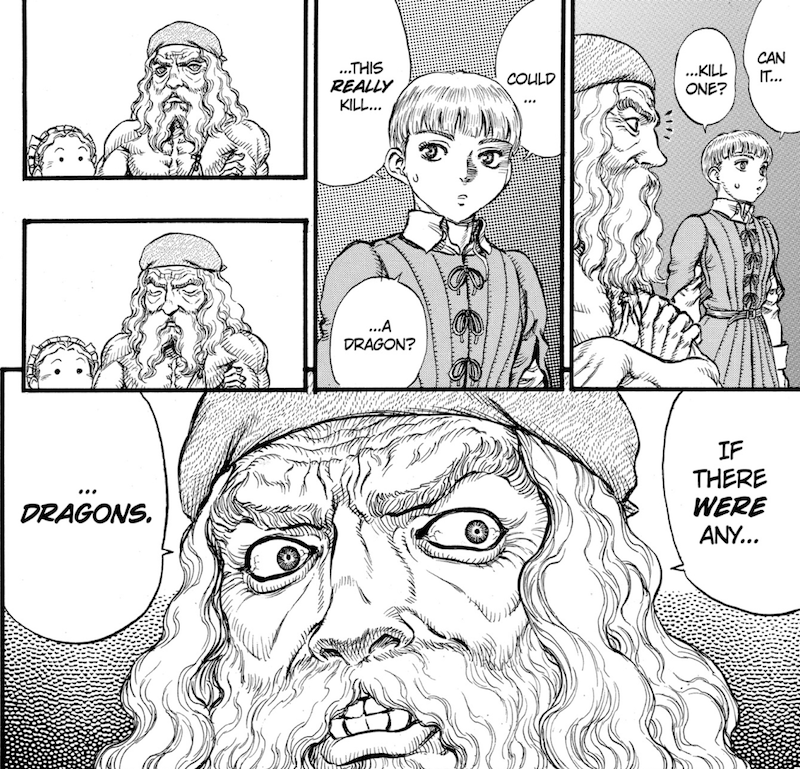 Guts very pointedly does not need an army to kill a dragon. Arguably, the “good idea” rule provides a way to manage exceptions. 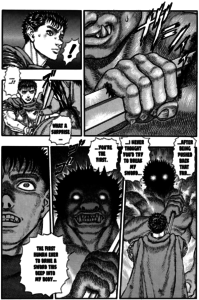 For example, it seems reasonable to consider blasting a demon with a prosthetic arm cannon (as Guts does to good effect many times) to be something like a good idea which supersedes the order of might. However, the rule is so underspecified, both in terms of immediate text details and suggestive examples, that it is basically just throwing the ball back into the referee’s court. I think this a very good point. Having supernatural creatures be much harder to kill is a good idea. However, one must note that in Berserk, the supernatural is almost hidden from the majority of humanity, with the setting being almost reminiscient of medieval europe pushed through the lens of Japan at times. This allows the Apostles to remain dangerous and special, while not diluting them. So for my settings, I like to employ a division between two types of enemies, Paranatural and supernormal. Paranatural things are like Elves, Orcs and Dwarves. Not human, yes, but also on the same level as mortal Human, more or less. If you stab an Elf, they’ll still die. Supernormal, on the other hand, refers to creatures that are beyond mortality. These are things like Demons, Dragons, and if my setting had them, Apostles. That is the best solution, I think. Re: the supernatural being hidden in Berserk: this is true up through the end of the golden age arc, but following the eclipse the setting becomes more and more phantasmagoric. What systems, if any, when player characters interact with the supernormal? Do you have some common approaches, is it all improvisation, do you build custom rules for every supernormal being, something else? I will take your word on that, as I’m currently in the middle of the Lost Children Arc, so I haven’t see much, post-Golden Age. As for what I do, I do make up stuff as I go, but what I mostly do is a merely supernormal characters and creatures on a pedestal, at least a little bit. They are just stronger then mere mortals, so of like how the Godhand is displayed or Bill Cipher is treated by their respective narratives. They just have more power, more presence, and merely by showing up, they raise the stakes. For specific rules, I usually just make them impossible to harm with non-magic weapons and some have damage reduction, but I like the idea of a Damage Threshold as well. As long as it is set low enough, such as at 6, that’s not an impossible hurdle to clear but also prevents every single attack from hitting. Additionally, since I mostly use supernormal enemies for Boss Fights, you can check the link below, which are my compiled thoughts on the subject, and almost all of what I write there would apply to a supernormal enemy or character. This is easily one of the most interesting aspects of Berserk to me, and you managed to capture it perfectly, I think. This is a really cool idea… So if I have some demon lord with a threshold of 10, when the fighter rolls 9 damage it amounts to nothing. But hitting him for 13 would deal 1 Supernatural Hit Point? I wonder how the math compares to using a 3.x-style DR 10/+1 or whatever? I guess it really makes a difference with respect to overruns: 19 damage is still 1 Super HP. So it’s actually tougher than DR, which is in keeping with your theme. Although of course this varies with actual HP or Super HP totals. I think using an orders of magnitude approach like this would work better than damage reduction, but the number of higher-order hit points that a supernatural being has would not need to be very high to still make a challenging monster. Yeah even a 4 or 5 SHP monster would be a tough fight for my players. I guess I better go back and watch some Berserk again! I of course like the damage threshold idea, but don’t see it as incongruous with the magic weapon system traditional to D&D. Threshold for me works best as a damage reduction that culminates with or interacts with immunity. Thus a pussiant foes – say Slaine in a ‘warp spasm might have a damage reduction of 2 or 3 to all damage, but an immaterial ghost has no reduction, it’s just immune to normal attack but tales normal damage from silver/blessed and magic weapons or spell attacks. A Dragon in the Berserk sense might be both damage resistant to a point(s) where only seige weapons can really hurt it, and immune to normal weapons or fire or whatever. A character like Guts might also have a class ability to inflict magic damage and weild an artifact weapon that does ballista bolt damage. This give a variety of monster design tools for defense (A.C., immunities, damage reduction (or absorption either per round or total)) and magic weapon design (treats all armor as A.C. 5 is something I’d give Guts’ Dragonslayer – it ignores armor, but it’s also clumsy). The only disadvantage here is a lack of rules systemization and the loss of that ‘it’s serious, that mecha can only be hurt by MEGADAMAGE’ moment. Agree. Seems reasonable to mix other kinds of damage resistance in, especially for entities with one foot in each realm. Anyway, great article, as usual. I’m normally just a silent reader, but I suppose I can take the opportunity to say thanks for the great reading you’ve provided over the years. Like most of the commenters, I like where this is going. One thing that caught my attention is that it feels like you’re working on inventing and contextualizing the damage reduction (DR) that we saw starting (if I recall correctly) in 3E. The main difference is that your version seems to be based on division (dmg/6 or dmg/10, presumably rounded down) rather than subtraction (dmg-5 or dmg-10), as it is in the published versions. At 6hp of damage the effect of dmg/6 and dmg-5 is the same, but after that it’s going to diverge sharply – with subtraction a sufficiently mighty blow will actually threaten the “dragon” with meaningful harm, while with division you’re never going to do more than chip away at their health one point at a time. The latter could, as you say, encourage creative play… but it could also encourage reliance on magic. Why wrack your brains when a fireball does multiple d6s of damage, after all? You got it right the first time. My intention was to model higher-order quantities, which is consistent with a multiplication or division operation, rather than an addition or subtraction operation. Someone else brought up 3E style damage reduction on Google Plus as well, so I probably should have covered that explicitly. I agree it could foster reliance on magic, and the availability of direct damage type spells in the campaign would likely be another interactive factor influencing how everything plays at the table. Depending on how direct damage went down, it could be in keeping with the Berserk tone too: consider Guts’ arm cannon as fireball. In the approach I outline above, every hit that registers is like 10 HP. I don’t think this would necessarily lead to more of a slog, but of course one would need to keep SHP relatively bounded (and, as another commenter mentioned, perhaps work in other kinds of weak points). What’s the point? If you create a threshold where PCs can only do 1/10 damage against supernatural creatures, you’re just turning combat into a long, tedious grind. Or encouraging TPKs. Surely, the best way to deal with supernatural creatures is to say that they can only be defeated by very particular means. So perhaps something like a dragon requires seven different types of magic / magical weapon used against it (in a short period of time, and in order) before it can be killed, each type reducing its supernature and bringing it closer to being what we would understand as mortal. This would represent a real challenge to a party, but is still doable. It also entails a lot of set-up actions (what magic / weapons?, where can these be found?, who guards them?, why would they give them up?). Other prerequisites for harming the supernatural could include rituals (performed before the battle, or after the enemy has supposedly been vanquished), sacrifices to appeal for divine intervention, potent curses (hurled at the enemy to nullify their supernatural gifts), vulnerability only in specific places/times (perhaps a ghost of a dead warrior can only be destroyed on the battleground and/or anniversary of its death), or to certain individuals (a dragon vulnerable to blows from a certain bloodline – once warriors, now lowly carpenters). Sure, there are multiple approaches one can take to emphasizing the character of the supernatural. Have you read the Berserk manga or watched any of the animations? I am trying here with this method to capture the feeling of Berserk. 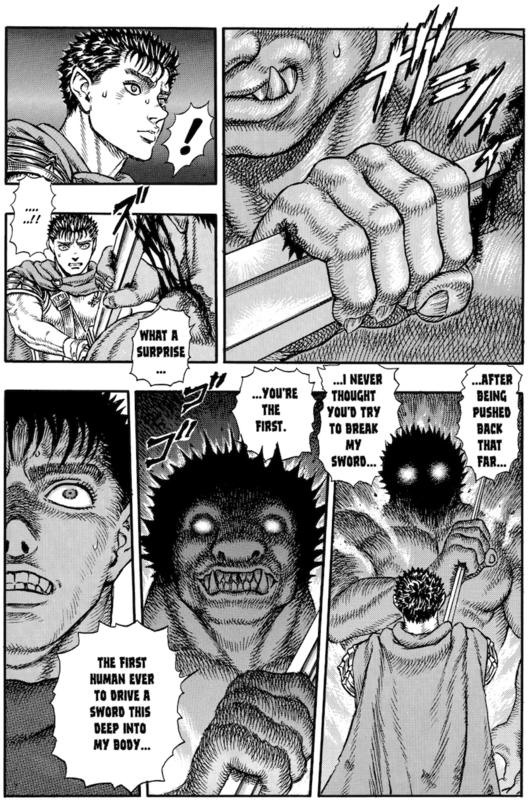 Guts doesn’t need to find special magic weapons, recruit antagonistic components (such as silver versus werewolves), or discover an Achilles heel, at least most of the time. The method you suggest seems closer to fairy tale logic, which I think also works well, and can fit nicely into a problem solving game style. But that would be a different post. Within a long-running campaign, it probably makes sense to use multiple approaches when designing supernatural opponents to keep things challenging and fresh (with sufficient clues for new kinds of challenges, of course). I haven’t read Berserk. But from your description of how the main character slays ‘dragons’ he uses a specific weapon, and his human faculties and ingenuity. It would be a travesty to just add a damage divider in to a game in order to represent the need for human ingenuity to overcome a creature. That seems to me to be the very antithesis of what role playing should be about – human ingenuity should be represented by the opportunity for PCs to display… human ingenuity. Not just rolling enough damage to overcome a monster’s damage divider, which requires no intelligence whatsoever. Human ingenuity doesn’t have to be represented by the kinds of methods I outlined in my previous post. Tactical ingenuity might be a different way of killing such creatures, for example. But then the GM needs to set up the fight such that PCs have an opportunity to display tactical ingenuity, using the terrain, props or other elements within the field of combat. In other words, they don’t just meet the creature in an empty, square room in a dungeon. I think this is a very interesting question you’ve posed here, but I think your proposed solution is based upon a category error, i.e. you are replacing an opportunity for role playing and decision-making with a mathematical modifier. By setting up chances for PCs to come up with solutions, supernatural creatures could become richer, singular entities. Reliance on damage systems to simulate this is effectively just a stat bump. So the dead simplest implementation of this idea would be to just eliminate hit points from supernatural enemies; they only take damage in Hit Dice. Whatever die is used for the creature’s type (if you’re in to that sort of thing) is then your damage threshold. Attainable, but as difficult as killing a regular person with a single blow 5 or 6 times in a row. Then, if magic weapons deal one Hit Dice of damage each, this makes them feel more magical in sweeping down hordes of 0-level goons, while making them a good stepping stone toward that higher magnitude. I like that, especially how it also helps keep bonus inflation down. I like this idea. I think that, as others have pointed out, there is a risk that damage spells will become the most common tactic used against such enemies because they tend to have high burst damage. You would need to give the mundane characters some tools specifically geared towards increasing their damage. One option would be to take a penalty to the attack roll in exchange for extra damage – but then maybe you are effectively just giving the monster higher AC. Another way would be to attack from stealth – in LotFP the Specialist can potentially get 5-6 times as much damage when striking a surprised enemy. Or perhaps there are extra-huge weapons that deal multiple dice of damage but carry a significant encumbrance penalty. My LotFP campaign is based on Berserk, there are no magic weapons in the sense of D&D, but there are weapons made for a purpose: to hurt a very specific creature. 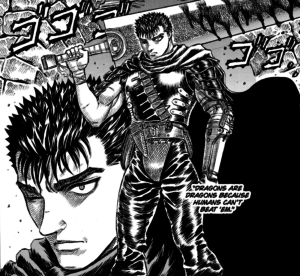 Guts’s weapon is nothing special, but it’s hard and heavy and he is very strong, he can harm supernatural entities because his weapon deals 1d12 damage, almost always overcoming the threshold of 6. But he would be dealing 7 or 7 points of damage, which deducted from the threshold amounts to 1 or 2 real damage. I don’t think that works right. The supernatural entity has an amount of super hp depending its “level” or rank or something. A troll and an ogre and an apostle all have super hp, but not the same amount. Maybe the troll has 1 super HD, the ogre has 3 and the apostles have 4 or 5. To cause damage to these entities, you need to overcome a threshold, which is also variable depending of the super HD. The troll has 1 super HD and 5 super hp. Normal damage doesn’t harm him, unless you overcome the threshold. Whenever it is dealt 6 points of damage IN A SINGLE ROUND (that would be rank C threshold), you roll a super damage die (perhaps all super damage dice are d6, perhaps each rank has a differente super damage die–better ranks, smaller die). This is something I have been thinking about and haven’t used in my campaign yet. I have to analyse it well before I introduce it. What you describe to begin with is closer to 3E-style damage reduction, where damage = 1d12 – 6 (or whatever), rather than what I propose here. Your second suggestion (super HP) is more or less what I was calling supernatural HP, and would be intended to represent higher-order durability. The relationship between higher-order (supernatural) HP and normal HP is multiplicative rather than additive (a damage reduction approach would be additive). Personally I probably wouldn’t bother with a super damage die, I would just have a successful attack (one that beats the threshold) deal a single point of higher-order damage (basically a “hit” in the old wargaming sense) and this also suggests a simple implementation where super HP = HD. Either way, I would like to hear about what you try and how it works out for you. I haven’t discussed this anywhere; I have a blog but it’s in Spanish, and doesn’t contain anything about this topic, but I will bring the theme into the OSR group on MeWe once I have a more defined approach. This being looks like a dead tree covered in fungal mass; it has a grotesque mushroom cap on top. It has long thorns and snake-looking tendrils all over its body. If a person gets close to it, it is attacked by a thorn, and the creature gets a second, free, attack with a tendril, causing 1d4 damage and the victim must save vs poison or die. In 1d3 days, the corpse return to life transformed in a Treefolk (a non-supernatural monster). Spore ray. When Obrey Amadan loses more than 1 SHP in a single round, make a morale roll; if he succeeds, he continues fighting; if he fails, he makes an attack with a burst of luminic spores. The victim must save vs poison or gets contaminated, dying in 1d3 days. Obrey Amadan dissolves and when the victim dies, his body transforms into a sporocarp (fruiting body), giving birth Obrey Amadan anew. Each round, the entity must suffer normal damage equal to its threshold, or more, in order to suffer actual damage. One super HP point is dealt whenever the threshold is surpassed once in a single round. For instance: Rank C entities, causing them 6 to 11 (virtual) damage in the same round, deals 1 super damage point, i.e. one actual point of damage; 12 to 17 virtual damage deals 2 actual damage, an so on. Super damage die I mention in the last post is an idea I’ve been mulling with, because I think an apostle can be killed, rarely but not impossible, with a single attack or in one single round. At the same time, I like the idea of reducing dice rolls. Once I know this monster works on the table (LotFP system), I’ll come again and tell you.